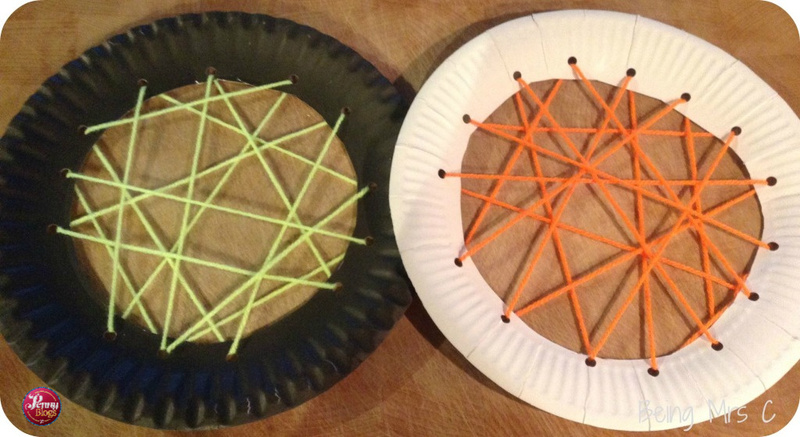 I first blogged about making a paper plate spider’s web as a Halloween craft over on Being Mrs C several years ago. Seeing as Halloween is approaching it seemed the right time to dust off the festive cobwebs and share it again. I saw a picture of this make on Pinterest (my favourite place online right now – please pop over and follow me if you don’t already) when doing some insect crafts with the kids earlier in the year and knew that it had to be on my Halloween list of things to make. The yarn in my Bostik Bloggers box from Craft Merrily was the perfect prompt. Paper plate spider’s webs are not only easy to make with young children, but they also look really effective and are great for children’s fine motor skills too. 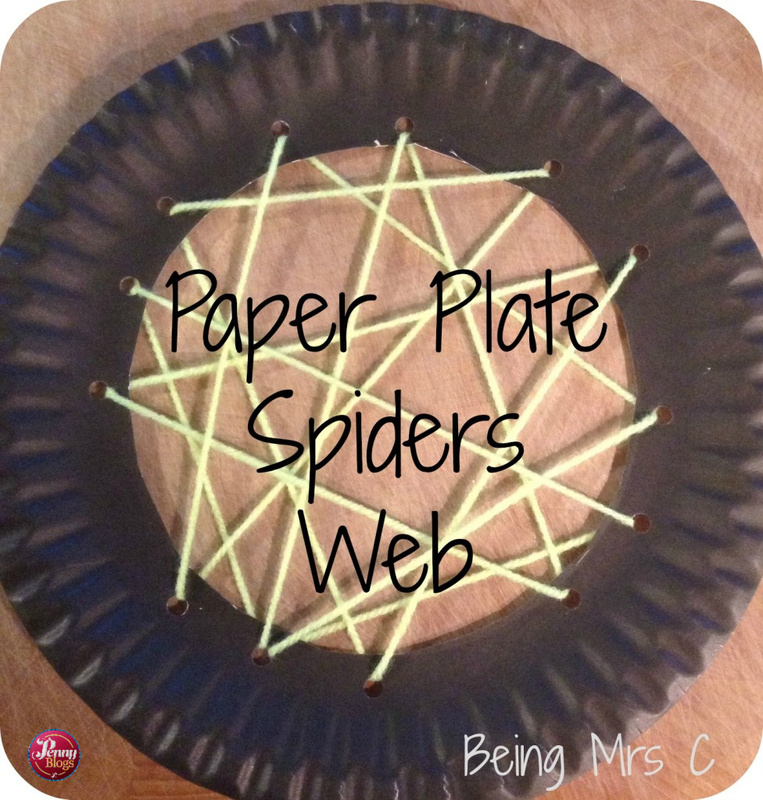 What do you need to make a paper plate spider’s web? 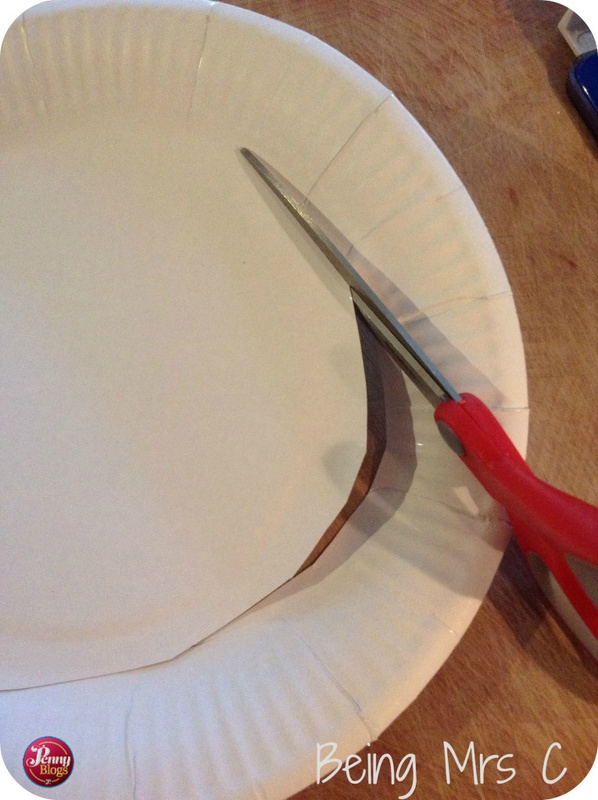 The first thing you need to do is cut out the middle of your paper plate. This can be a bit fiddly to start off with and you might need to fold the plate in half to start off your cutting, so it may be best for an adult to do this part. 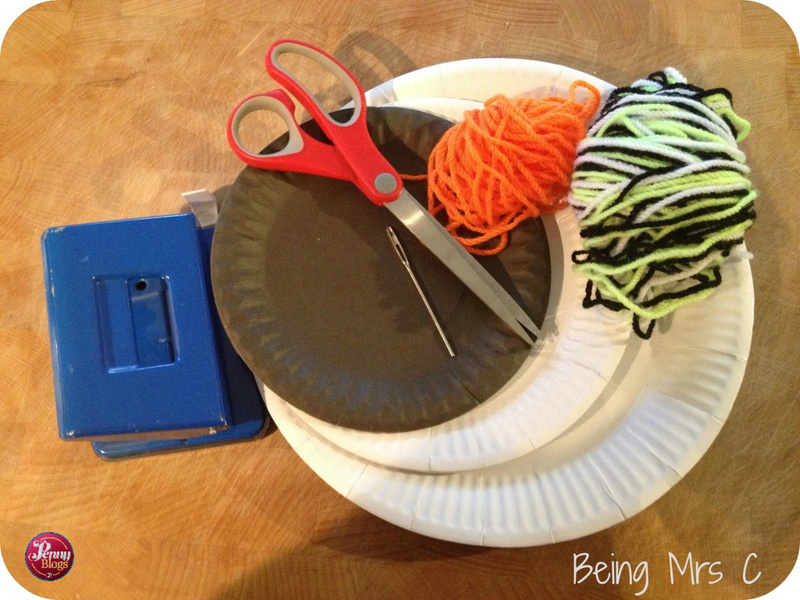 Once you’ve got just the rim of your plate left use the hole punch to make holes around the inside of it. Space them out a bit, but they don’t need to be very evenly spaced, nor does it matter how many you do. It seemed Little Miss C had never actually used a hole punch before so we now have piles of paper and paper plates all with holes punched in them as she enjoyed doing it so much! 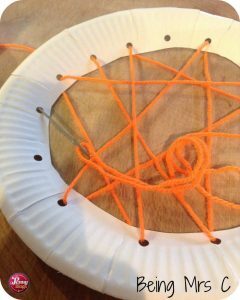 Thread the yarn on to the needle and start lacing it across the inside of the cut out plate. 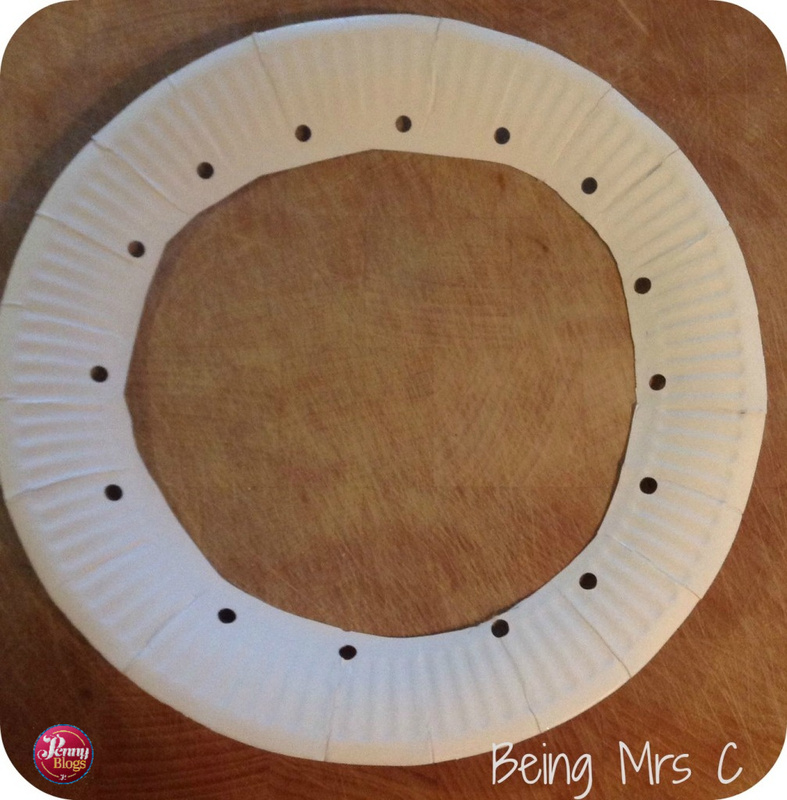 It doesn’t matter if you go in and out of holes you’ve already used, or what order you go round the holes, just try to make sure you’ve used all of them. Putting the needle in from the front or the back of the plate also doesn’t matter. This part of the activity is perfect for children – the holes are big enough for them to easily fit the needle through and it doesn’t matter at all as to what order they lace it all up in. Try to finish by either going through the same hole where you started, or the one next to it and then just tie a not in the two ends of the thread to secure it. These are perfect for hanging up as decorations for a Halloween party and would also work well with a small toy spider attached – as I’ve seen on Pinterest – but it seems that I just can’t find anywhere selling toy spiders this Halloween. I’ve searched all the local shops to no avail. I’ll keep my eyes out though as I think it would be the perfect addition. Disclaimer: We were sent a box of craft goodies as part of our role on the Bostik Family Craft Bloggers Network when this blog post was first published. This post contains affiliate links. It’s hard to believe that it’s two years since I ventured off to Tea and Tents for the first time, and boy how my life has changed since then. Back then I described it as one of the most inspiring weekends of my life and just being back in the same place and seeing how far I’ve come since then was in a way quite humbling. The Women’s Institute has helped turn around my life over the last few years. It’s given me confidence, courage and ambition, and without it I don’t think I would have made the changes I have to my life. I realised how unhappy I was and made differences to give me and my kids a better, happier life. The WI as a whole, the experiences I’ve had there and the friends I’ve made are what made all this possible. When I discovered that the 2018 event was the weekend after my 40th birthday it seemed like the perfect time to celebrate with some of my closest girlfriends. What I didn’t realise when I booked my ticket was that I would by then be 24 weeks pregnant. Or that the country would be in the middle of a massive heatwave. Never fear though – with a paramedic in my WI group, plus my mum and sister living just down the road from Walesby I set off determined to have a fab time and I did just that. Last time round I was totally disorganised (possibly something to do with the amount of gin I took with me!) but with a clear head I this time planned my activities somewhat more and even booked in for some workshops and activities before I went. For those unfamiliar with it, Tea and Tents is an unofficial WI festival that runs over three days on a Scout camp in Nottinghamshire. With over 500 women of all different ages and backgrounds, it’s a completely unique experience that I think is one that all WI members should try to see for themselves. There is so much on offer that even after being more organised I still only feel like I scratched the surface of what there was. But I once again came home from Walesby feeling reinvigorated and motivated in a way that I hadn’t before. Being pregnant meant that things like axe throwing were off the agenda for me, but instead I aimed to strike more of a mental balance by signing up to a variety of craft activities. I started off the weekend by totally throwing myself into the festival vibe and making a flower crown. How else are you supposed to look when going round a campsite in your pyjamas in a morning? I’ve never really been very good with fresh flowers, but Polly was a fantastic tutor and gave us a great workshop showing us how to form the basic crown from wore and then adding on flowers as we wanted to. Bearing in mind we all started off with very similar flowers, it was amazing just how different all the finished crowns were. But that’s individuality for you. I booked onto a card making workshop on a bit of a whim. Mainly because I was looking for something to fill a time slot and because a couple of my friends were going. I’m so glad I did though as I absolutely loved it and came away with a couple of completed cards. It also introduced me to Stampin’ Up and I know I’ll be heading there way to order a few bits for some Christmas card making later in the year. There were so many sewing and needle felting workshops that I wanted to do, but in the end I went for one simply titled “stitch a suffragette”. With no picture as I guidance it was a bit of a case of booking in the dark, but I’m so glad I did. Run by a mother and daughter team from Old Town Belles WI, it was quite simply one of the most organised workshops I’ve ever been to. With pre-prepared fabric hoops and kits consisting of all the pre-cut pieces of fabric we would need to create our suffragette (as well as detailed written instructions) it really did make the process of creating such an impressive looking piece of embroidery quite simple. The two hour session just flew past and I’m so pleased and proud of my finished piece. Another member was telling me about how she was planning to add hers to a suffragette collection of artwork and memorabilia that she had in her downstairs loo and that somehow seemed just strangely perfect. The other highlight of my weekend couldn’t really be any further away from the stereotypical Women’s Institute image of stitching a suffragette. After signing up for a swimming session at Walesby I was convinced by some of the other women online to join them in the organised skinny dipping session. And somehow I agreed to this without a drink inside me! Two years ago there were stories floating around the camp about an impromptu spot of skinny dipping, but this time around it was far more pre-planned. With a lifeguard and everything! Quite what made me sign up to do it I’ll never know. But I’m so glad I did. Never before have I felt so liberated and free. Naked in an open air swimming pool. My pregnant body fully on display. With a bunch of women that I had never met before, but yet I felt so comfortable. And heck that water was beautifully refreshing when it was so hot outside. What a way to celebrate turning 40! Just two days before my 40th the blogging world lost one of its brightest stars. Kate from WitWitWoo died suddenly, and we were all left stunned. How could someone so full of life be dead? Kate always told us to live life to the full. Not to worry about what everyone else thought. To wear what we wanted to wear. To be who we wanted to be. The blogging community came together in a way that Kate would have loved so much. Inspired by T from Mummy Barrow we all decided to make the following weekend by embracing body confidence regardless of our size or shape. Bloggers across the country (and around the world on holiday in may cases) showed off their swimsuit selfies on social media. She would have laughed so hard (especially as many of us realised just how damn hard it is to take a good selfie in swimwear!) but I know she would have also been proud. #BeMoreWitWitWoo has already become a mantra for so many of us, and that’s exactly what I was doing when I went skinny dipping. Take these crazy experiences that life throws at you and embrace them as much as you can. The final message that I took home from Tea and Tents this time round was being realistic about what is possible in life. A deflated air mattress, a bad bag, and crazy temperatures meant that the camping element wasn’t the easiest of things to deal with. The final night I headed off to my mum’s rather than endure another night under canvas. Although I missed out on some time with my friends (who it seems managed to stagger round most of the campsite making friends into the small hours) I instead slept for a decent length of time, woke without aches and pains, had a loo just down the corridor when the baby decided bouncing on my bladder at 3am was a fun thing to do, and also got a hot shower the next morning. As a result I felt refreshed for my return home – and clean for once too!